Behold the Galak-Z. It’s going to explode a lot. We’ve seen no shortage of old-school style games created by small studios this generation, and because of this, people have grown a bit more cynical of nostalgia, which has seemingly been a cheap pull at making games look intriguing. 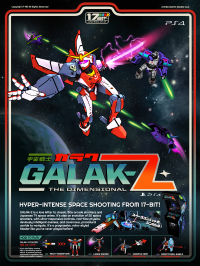 Luckily 17-Bit’s Galak-Z: The Dimensional is more than a look at how games once were. It’s the perfect example of an excruciatingly difficult game that utilizes concepts both old and new to create a fresh and addictive experience. The game stars and puts you in the shoes of A-Tak, a space pilot who’s been stranded at the beginning of the game and discovered by the crew of the USS Axelios, which unfortunately only consists of the informative purple-haired Vixen, Beam. For now anyway. Meet Beam, the most helpful woman ever. 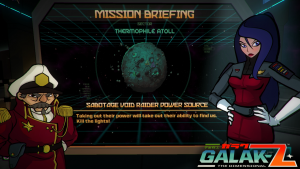 The story in Galak-Z is one that’s fairly simple, which may come off as a bit of a surprise as it’s an old-school style roguelike game. Other roguelike titles, such as Rogue Legacy turnout to just be glorified dungeon crawlers. The plot begins to unfold as you make your way through various missions in the form of “seasons.” The game portrays itself like a television series that gets better and better with each episode you finish. So aside from rediscovering his piloting ability with the help of Beam (and your dexterity), A-Tak learns more about himself, what happened, why the Axelios is in its current predicament, and a whole lot more. Each season consists of five episodes that you must complete in succession to gain access to the following season, and that’s easier said than done. When you die, you have to start all over again, and no two levels are the same. Since each level has a different story, you’ll probably die enough to the point where you’ll have to go through the same mission a few times, but they’ll each be different as each level is randomly generated. Whether it’s a level in which you’re just exploring the asteroid fields, finding loot, rescuing a team member, or even fighting an insane boss—you’ll die, and you’ll die a lot. 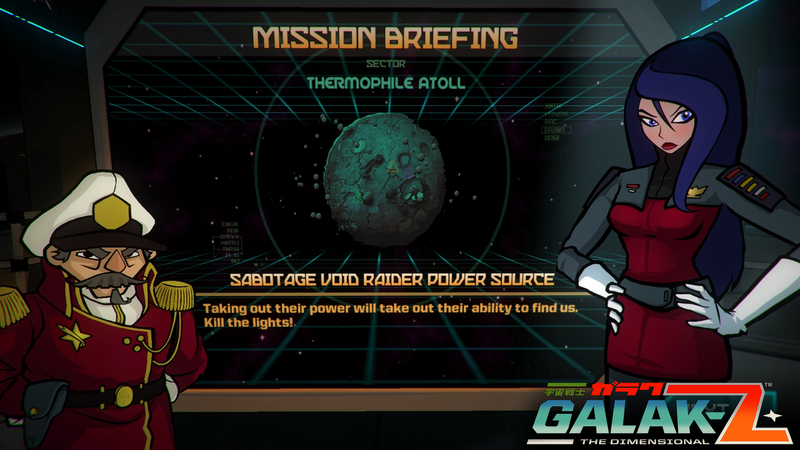 For starters, the game begins with a tutorial that goes over the basics of maneuvering your ship, the Galak-Z. While the tutorial is simple enough, the act of mastering the art of space travel is an accomplishment in itself. The controls aren’t tough by any means, but at times the game will make you feel like you have all the freedom in the world, whereas other times you’ll feel like you can’t control the ship if your life depended on it. This happens more so when the action gets hectic, and you have to decide whether it’s best to fight or flee. This is the one area that the game suffers in because it could drastically affect gameplay. If there’s a whole lot of stuff happening on the screen, there’s some noticeable slowdown (made much worse if you’re playing on the PlayStation TV with Remote Play). A patch just as big as the game was released when the game launched, but there’s still some noticeable lag that we hope gets fixed as one missed frame can royally screw things up, especially with the game’s complex control scheme. If an enemy’s field of vision is red, they see you. So should you fight or run away? Either decision could prove costly. In a nutshell, control of the Galak-Z is mostly accomplished using the forward and backward thrusters activated by the R2 and L2 buttons respectively. Holding the X button rapidly fires your primary laser, while the right analog stick aims your weapon. When needed, holding R1 also gives you a temporary speed boost when traveling. As easy as this may sound, control of your ship is really a different monster when you have to rid yourself of space pirates and bugs while flying in reverse. It gets even more complicated when you eventually earn the ability to juke and strafe. Through exploration alone you’ll be able to gain even more weaponry, including missiles early as well as the ability to transform into a mech on the fly, allowing you to perform melee attacks. It all sounds good right? Of course it does, but remember, if you die, you immediately go back to the first episode of the season. Luckily the ability to turn into a mech comes at Season 2, so you don’t have to worry about starting over again entirely. 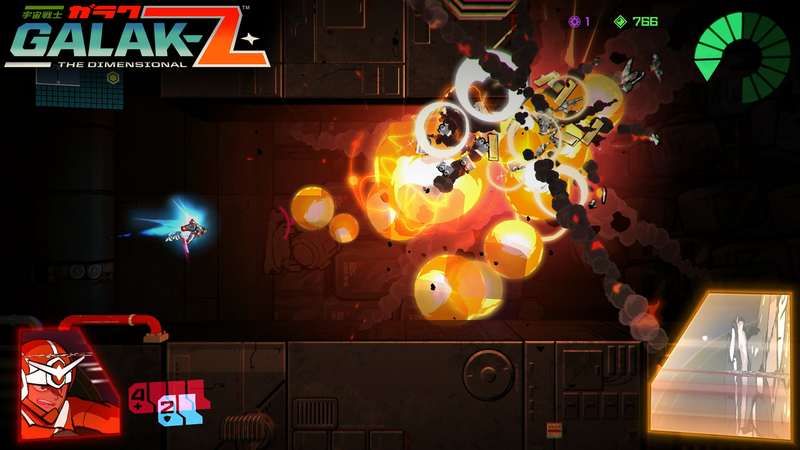 Because of its overall look along with its controls, Galak-Z is often mistaken at first glance as a twin-stick shooter or a shoot-em-up, but it’s far from that. 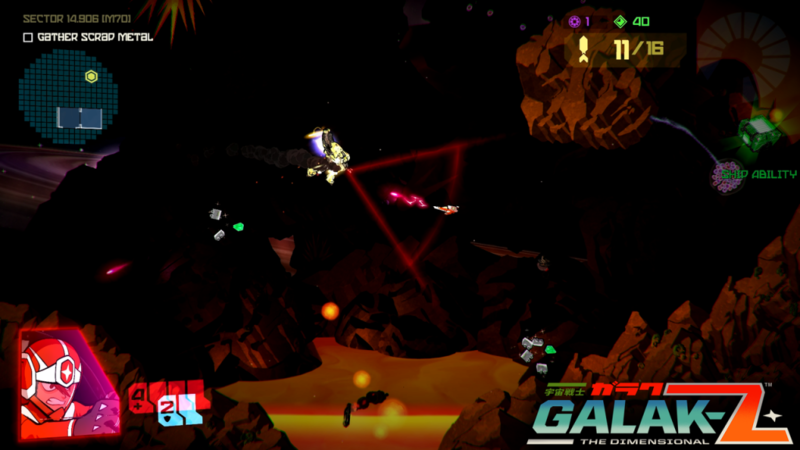 Galak-Z is about as close to a sci-fi open world shooter as it gets, but it also borrows rather heavily from the style put forth by Metroidvania-style games. The game isn’t on rails like Gradius, and you don’t go from one direction to the other. For the most part, missions require you to perform an objective mainly done through intense exploration and combat, and once you find what you’re looking for — retreat. In Season 2, you get to be a mech. Remember the end of Super Metroid where you find Mother Brain, kill it, and get the hell out of there? Galak-Z is pretty much like that, except you do it over and over. And if you die, don’t expect to go through the same path you did before. It’s all different. 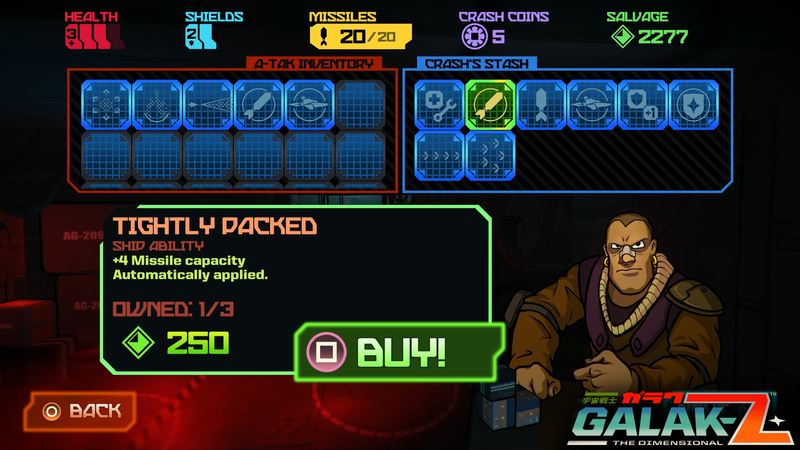 Strategy and self-awareness really prevail when it comes to success aboard Galak-Z. Though the fact that you’re in outer space gives you the illusion that you’re isolated and lost, you actually do know where you are at all times. By tapping on the touchpad, you’ll bring up a map that indicates your position, the position of where your objective is, and where you started the level. In addition, while exploring, you’ll also be given an indication on the screen as where to move forward, along with the direction nearby enemies are lurking. Much like Metal Gear, you can decide to be a hero and take them out, or just swiftly ignore them. Should you soup up your ship or tough it out for an extra life? The answer isn’t a simple one. Galak-Z just isn’t one of those games where you can rush into everything head-on. You’ll die if you do that. But at the same time, you want to be able to finish a level swiftly. To help you, you’ll eventually gain access to a merchant that’ll take your salvage and upgrade your parts. At that, you can save your funds and use it for an extra life at the cost of simply not spending between or during each mission. Or you can also find his shop hidden in each level. So it’s a catch 22 — should you beef up your guns and vessel to make it easier to survive? Or should you pass on all that knowing that you’re probably going to die anyway? A rather large part of the appeal that this game may get will be due to its colorful anime-like visual style. Throw this in with the fact that each level is an episode of an overall season, and the game eventually does begin to feel like an anime, especially with some episodes being more pivotal than others as far as content goes. And of course, there’s the difficulty. There are a countless number of games that are hard. Mega Man makes you think, Contra makes you react, and Mario Kart‘s 150cc just makes you want to throw your controller out the window, but when you finally beat that boss, conquer that level, or get that gold, there really isn’t much of a comparable feeling to a gamer. I didn’t finish the first season until the end of my second night playing the game. That said, I’ve died more times than I can count, and I really can’t describe the feeling I had after finally finishing that first season. Then I got overly lucky and sweated out the second season after only about six failures. I honestly haven’t even finished the game, but the pride I have just for being where I am says a lot about the game’s overall value. 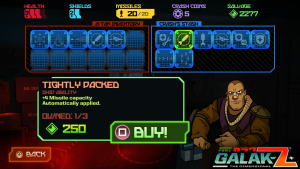 The sense of accomplishment you get with Galak-Z is about as valuable as it gets, and it only gets more intense with each season you complete. 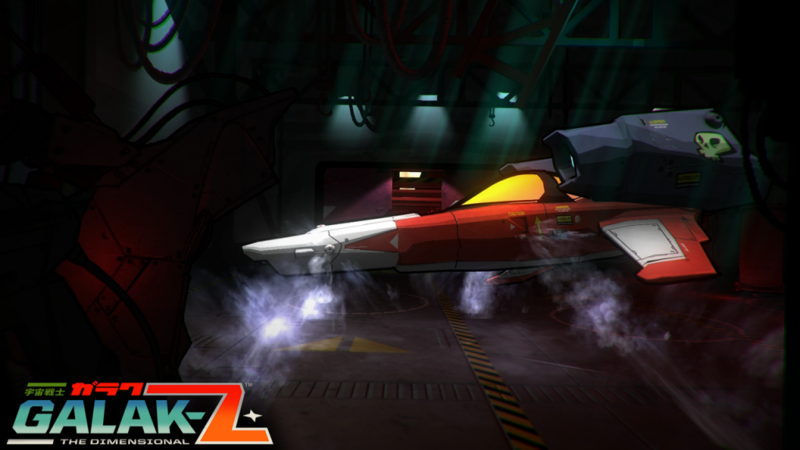 If you don’t like the certainty of failure when playing a game, then Galak-Z is an easy pass. But if you appreciate a real challenge and want that sense of accomplishment you can only get by not giving up, Galak-Z: The Dimensional is a must-buy and will keep you busy for a lot of stressful hours. It’s a shame the Vita version was cancelled because it would be a whole lot of fun on the go. The game was provided via review code by the publisher.